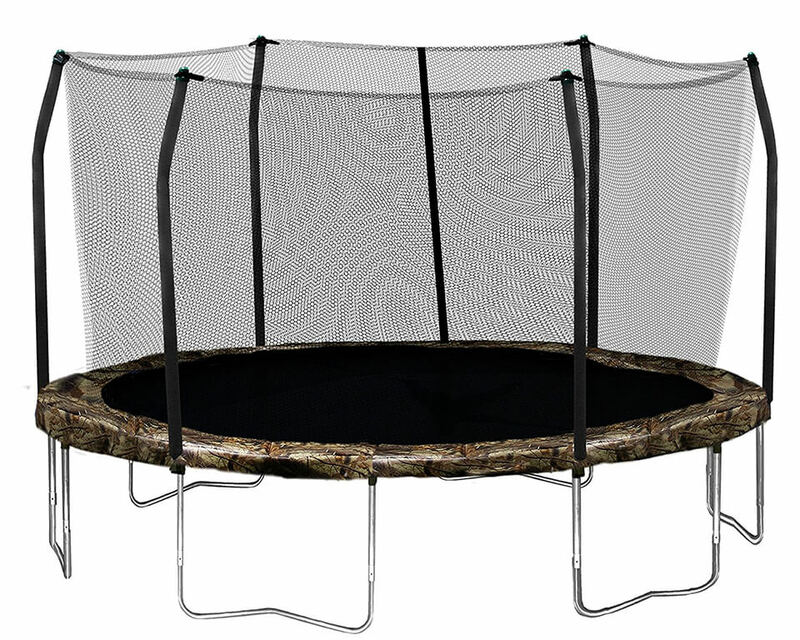 Skywalker Trampolines offer a variety of trampolines in many sizes. This time we had their 15. ft. version on a test. Have in mind that this trampoline is available in other colors, green & blue to be exact. It’s obvious that this trampoline is not much different from their 12 ft. version. In fact, it is all but the same, save for the size and the corresponding changes that need to accommodate for it. While generally we feel that variety is exciting, in this case more of the same is good. Everything we said for the 12. ft. version also applies here, except that there is a whopping 143 sq. ft. of jumping surface. However, the design is much better. 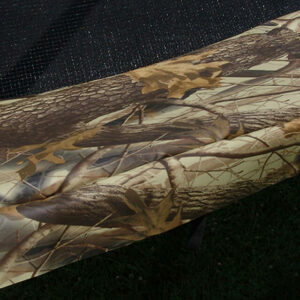 The camo pads are absolutely stunning and the trampoline looked fantastic. It just looks so good, with a brownish color tone (it doesn’t look like army camo at all). he smaller one is also available in camo design, but ours was blue. Camo is more expensive than the other options, so bear that in mind. The enclosure, for example, is very safe with zippers and buckles. Even if a zipper fails, the latches still keep the trampoline closed. The enclosure netting attaches to the V-ring spring clips. In other words, the springs are outside the jumping surface. The net is tightly woven and there is no risk of twisting one’s fingers in there. The technology has even been patented. The enclosure netting attaches to the V-ring spring clips. In other words, the springs are outside the jumping surface. The net is tightly woven and there is no risk of twisting one’s fingers in there. The technology has even been patented. 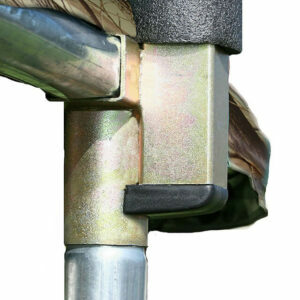 The enclosure poles are padded and angled so that the enclosure can better protect the jumpers. The poles are only angled at the top, thus allowing for more jumping area with less risk of collisions with the poles. The same high grade steel as in other Skywalker trampolines is used in this trampoline as well. The frame features welded T-sockets for stability and rigidity. The sockets are galvanized. We feel that such sockets also shorten the time required for assembly. The springs are better – there are 96 of them and they are an inch longer than in its smaller sibling – 6.5 inches in total. The feeling is better than with the 12 ft. trampoline, primarily due to the number of springs, as the mat is very much the same. The springs are rust-resistant (galvanized) so a bit of rain should not damage them. The bounce is a notch better than in other low to midrange trampolines. 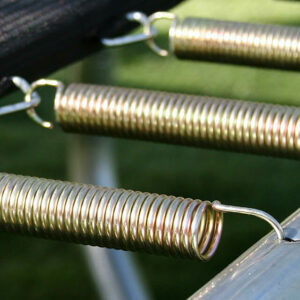 The quality of the springs shows and translates to a better, firmer bounce. The safety pad is adequate; the most prominent aspect is its wacky and interesting design. Both the pad and the mat are UV resistant and can be left outside. We advise wind stakes if you’re expecting bad weather. The same Skywalker warranty also applies – 1 year on the steel parts and 3 months on everything else. This trampoline is more difficult to assemble, as the parts are larger and there are more springs. You will need about two hours minimum. The instructions are clear and feature detailed diagrams, along with example exercises. No accessories are included, but they can be purchased additionally. Of interest are the trampoline wind stakes that help keep it stable during bad weather. We would have liked some extras, especially considering its price. Even ladders cost extra. We didn’t like the pathetically low weight limit, though. Just 200 lbs. for a 15 ft. trampoline? That’s just too low. And the sad thing is, the trampoline is capable of so much more and we aren’t sure why the manufacturer doesn’t believe in their own product. Our 220 lbs. reviewer tested it without any issues, and other customers report that it withstood weights of over 300 lbs. But we cannot recommend that you do the same, so the takeaway is – this weight limit severely limits its capabilities. If weight limit is not a problem for you, then Skywalker trampoline is very good choice. It is at a sweet spot between price and quality. Plus, it looks fabulous, so if the design is important to you, you’ll be hard-pressed to find anything better. Otherwise, look for something else.